Anthony William, the Medical Medium, has helped tens of thousands of people heal from ailments that have been misdiagnosed or ineffectively treated; or that medical communities can't resolve. And he's done it all by listening to a divine voice that literally speaks into his ear, telling him what is at the root of people's pain or illness and what they need to do to be restored to health. 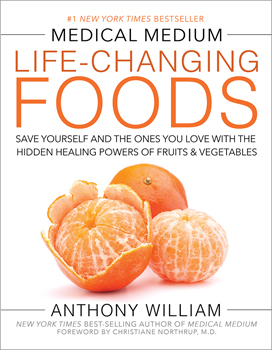 Medical Medium Life-Changing Foods delves deeper into the healing powers of 50 foods; fruits, vegetables, herbs and spices, and wild foods; explaining each food's properties, the symptoms and conditions it can help relieve or heal, and the emotional and spiritual benefits it brings. Recipes show readers how to use the foods most effectively, and gorgeous color photography showcases their vibrant appeal. Anthony also arms readers with the truth about some of the most misunderstood topics in health: fertility; inflammation and autoimmune disorders; the brain-gut connection; why we're losing sleep; foods, fads, and trends that can harm our well-being; and how angels play a role in our survival. Much of Anthony's information is dramatically different from the conventional wisdom of medical communities, and much of it has never appeared anywhere before. So readers shouldn't expect to hear the same repeated information they find everywhere, such as that oranges contain vitamin C. They can expect completely new information that will leave them with a deep understanding of why a banana offers more than simply potassium-and with a powerful set of tools for healing from illness and keeping themselves and their loved ones well in an increasingly toxic world.